My brief homily for the Third Sunday of Advent. Mary’s “yes” never ceases to amaze me every Advent season. As I re-read the story of the angel coming to Mary and telling her not to be afraid and that she has found favor with God, I cannot help but scoff. How in the world is telling an unwed teenage girl that she is going to get pregnant with God’s baby good news? Why would you tell her not to be afraid in a moment that is terrifying? How is this a favor? Then take into consideration the cultural context and time this takes place and this news is worse. And let’s keep it real, this would not necessarily be welcome news to an unwed teenage girl even in our cultural context and time. Throw in the fact that it’s God’s baby and you might have bigger problems. But aside from all of that, the part that amazes me every time is her yes. It’s HER yes. She hears this news and asks questions and although her response seems immediate, who knows? She might have had time to process and then answer the angel. What we do know is that when she responds, she does so with her own agency. She decides. She might not understand the full implication of everything, but she is willing to take on the responsibility of what it all means. In her society and in her family, this means she will lose even more power and agency (and she does not have much to begin with). It means she will most likely lose the privileges of what it meant to be female in that time—which is having her own family, which equated to safety, stability, and life. By saying yes, she just put all of that at risk. Mary, what were you thinking? Can I be honest? It’s easy for me to scoff at that phrase too. (I noticed I’m scoffing a lot today). Because how many times have we prayed for something believing God would change it, and God did not? When I was younger, it was probably something along the lines of praying that God would turn my brother into another sister. Nothing will be impossible with God? Well, that didn’t happen. J But what about the time I prayed hard for an illness to be healed and I lost her instead. Nothing will be impossible with God? And in light of the remembering of the Newtown shooting and more children killing one another this week, we have a lot of questions. I actually don’t have the answers to those questions for you today. But as I was reflecting this week, I know that what I do have to share with you is that you and I have the agency and ability to choose yes to God, and in this Advent season, hope and grace is being gifted to us, it has been given to us and it is come, it is coming, and it is already here—and no matter what happens to us or around us, it cannot be taken away. Even in the face of the grimmest circumstances, we proclaim that life and light will break through in the most impossible way. And the good news is we do not do it alone. Friends, every single person in here, we are all walking this journey of faith at different places on the road. Where are you? Some of you might be holding hands and skipping together, some of you are walking at a leisurely pace—some of you have been walking a long time, so you are far along the path—some of you have stopped and you’re standing still waiting for some motivation to keep moving forward—I bet some of you saw a squirrel and ran off the path to follow it—maybe some of you are sitting down and you do not want to move anymore—and some of you are standing at the beginning of the road and not sure if you want to get on it. And you know, no matter where you are, friends, I am more and more convinced that we all need each other. Yes, like Mary, we have the agency and the ability to respond to God, but once we respond, we not have to figure it all out on our own. Mary’s yes, though it seems like it would disempower her completely ends up being something that strengthens her and provides her with honor. Her yes, her choice to respond to God, gives her a voice to sing and speak a truth about God and what God will do through Christ. We heard it sung earlier…“My soul magnifies the Lord…God has shown strength with his arm, God has scattered the proud in the thoughts of their hearts… God has brought down the powerful from their thrones and lifted up the lowly; God has filled the hungry with good things!” WOW. Do you know how radical this song is? Mary can sing. 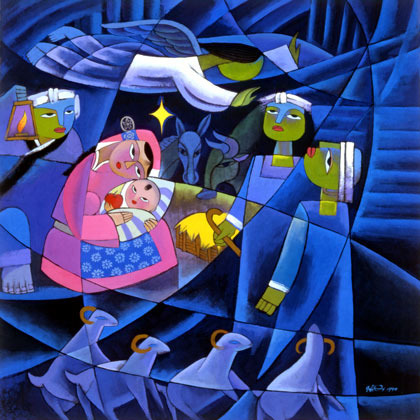 She dares to sing of a shifted paradigm—one where a young teenager is given agency to bear and birth the son of God. One where the hungry will be fed… One where she knows that the images and stances of power will be overturned. Because of the choice she made, an entire world order and paradigm shifted so that Immanuel, God with us, would arrive in the most vulnerable and powerless state to be a power and a grace that all of us would need. So as we continue to journey in this Advent season, what paradigm in your life needs to shift for you? What will Christ’s arrival bring this year? What will you sing as you walk along the path? And how will you journey and support the community around you as you go? Brothers and sisters, we have been surrounded by song today, let us too sing. May the “yes” we proclaim in this season be one that subverts paradigms and discomforts us, so that even as we may scoff, we may be reminded that nothing is impossible with God. Mary can sing and so can you. Let’s say yes to the journey together and see what happens. Amen.